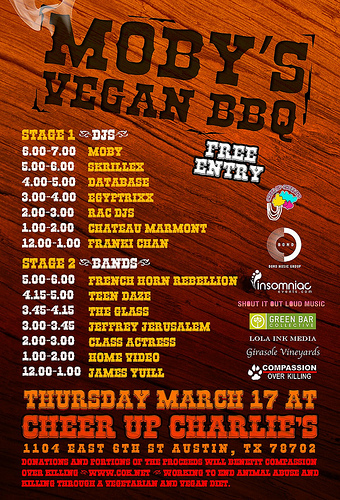 This year at SXSW, Moby is putting together a vegan BBQ party. Admission is free, but donations are being taken for charity. Entertainment will also be provided. Check the music lineup and full details after the jump. The BBQ party goes down March 17 at the one and only Cheer Up Charlie’s (1104 East 6th St, Austin TX). Although entry is free, all donations and proceeds will benefit Compassion Over Killing, an organization which advocates veganism and speaks out against animal abuse. Hosted by Moby, the party will also feature two stages of music, half the performances DJs and the other half bands.